Lizzy Yarnold MBE is a British sportswoman best known for clinching the gold medal in the skeleton at the 2014 Winter Olympics. The Olympic speaker began her sporting experience as a heptathlete, the inspiration coming from Denise Lewis at the 2000 Sydney Olympics, but in 2008 she took part in UK Sport’s Girls4Gold talent scheme and was identified as suitable for the skeleton. As testament to both her talents and the Girls4Gold scouting system, she went on to cement her place in sporting history after winning every major title in her sport of skeleton in the space of 407 days. Lizzy won the Olympic Skeleton event at the Sochi Winter Olympics on 14th February 2014, having led the field in every training run leading up to the Games and over the entire four-race event, her winning margin of 0.97 seconds was the largest ever. The Olympic speaker’s gold was the tenth gold medal ever achieved by British athletes in 90 years of Winter Olympics competition, and also ensured that Great Britain had won a medal in the Women’s Skeleton in every Winter Olympics since the event was introduced. Lizzy is also the first British athlete and second person ever to win the Grand Slam of titles including the overall World Cup title that she won in 2013-14, leading to her being awarded an MBE for services to sport in June 2014. After her sensational win at the 2014 Winter Olympics, Lizzy captured the hearts and imagination of the British Public. People warmed to the humble young woman from Kent who never gave up on her dreams and with a frightening determination, reached the pinnacle of world sport. Comfortable delivering a motivational speech, taking part in a Q&A session or working and interacting with groups or individuals, Lizzy is adept at tailoring her message to suit different audiences. Using her experiences from the world of elite sport and having studied ‘Mental Toughness’ at University, Lizzy can deliver sessions that will resonate your business. 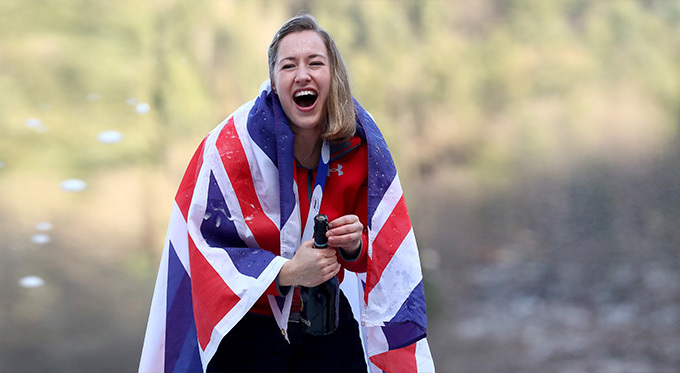 To book leading Winter Olympian, Lizzy Yarnold as the speaker for your corporate event or conference, simply contact the Champions Olympic agency by filling in our online contact form. For any further information, call one of our booking agents directly on 44 1509 85 29 27. Would you like to receive newsletters from Olympic Speakers Agency?